Refine MD offers laser vein removal for spider veins, varicose veins, facial veins, broken capillaries and redness. Our Sciton Profile ClearScan provides safe, effective treatment. Varicose Veins, larger than spider veins, appear as enlarged, bulging, and twisted bluish cords beneath the surface of the skin. 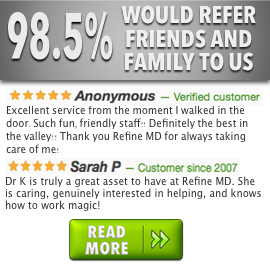 If you are considering treatment for your varicose veins, contact RefineMD for a free consultation. Spider veins, smaller than varicose veins, resemble a weblike maze of red, purple, and blue veins and are formed at the surface of the skin. If you are considering treatment for your spider veins, contact RefineMD for a free consultation. What is the Profile vascular laser? Profile is a new laser using infrared energy and the new standard for the treatment of many skin conditions. Profile allows your physician to precisely treat visible vessels, broken capillaries, spider veins, lesions, and discoloration of your skin. Your treatment will be tailored to match your skin condition and desired result. Your physician will use Profile to restore your skin’s youthful color. Broken capillaries and other visible vascular structures will be gently eliminated from the visible layers of your skin’s surface. Profile has the ability to provide a treatment that is optimized to your skin condition. Unwanted lesions will be preferentially heated by the laser energy and become less noticeable, some will disappear; and pigmented lesions will greatly improve. All skin areas can be treated. Popular areas are the face, neck, chest and legs. Discuss your needs with your physicion. There is little risk for the treatment of these benign conditions. In some cases repeat treatment will be necessary depending on your response to the treatment and the desired result. Your healing time will depend upon your actual treatment, and you may experience erythema (redness) which may last several days. There is virtually no recovery time and you may resume an active lifestyle immediately. Your physician can answer questions about temporary changes to your skin color and how they may be camoflaged. Some temporary redness may be present in the area that has been treated, however, this should subside within a few hours. Your skin will have a pink or red color that will resolve over time. You will need to avoid direct sun exposure, or use a sun block of at least SPF 15 when outdoors. There is little to no discomfort, however this varies from patient to patient and depends on the depth of the treatment. There is no need for anesthesia and your physician will discuss your options to properly manage any discomfort from the treatment. There will be no posttreatment discomfort. Your eyes will be protected with safety shields or glasses. Profile’s laser beam will be delivered to the area of your skin being treated. You may briefly feel a warm or hot sensation as the laser pulses are preferentially absorbed in the unwanted vessels, heating and destroying them. Your procedure may take a few minutes to half an hour depending on the size of the area to be treated. It is important to follow your physician’s instructions. You may be given some skin care products and instructions on how to use them. This will minimize your risk for inflammation or redness and ensure the shortest response time. Any vessels or pigment denatured by the laser will be reabsorbed by your body over a period of time in a natural cleaning process. Most small capillaries will become invisible almost immediately since they will no longer contain blood flow. Your skin will be sensitive to ultra-violet light and you must avoid direct sun exposure. Most of the conditions treated by the laser will have been caused by sun exposure, so avoiding sunlight will prolong your new youthful appearance. You need to cover your skin or use a good sunscreen whenever you go outdoors. Laser therapy is a proven treatment for treating unsightly broken and dilated vessels, as well as such other unwanted vascular lesions as rosacea, port wine stains, and other vascular birthmarks. In fact, the latest advances in laser technology have given us a method for removal that is safer, faster and more effective than previous methods. Lasers work by emitting a specialized light that passes through the skin and is preferentially absorbed by its target, which can be an unwanted hair, birthmark, tattoo, or in this case, the hemoglobin (the red portion of blood) in the unwanted vessels. The heat from the laser causes the vein to break up and disappear. There are several lasers available that work remarkably well in treating unwanted veins. Most people describe laser vein treatment as feeling like the snap of a rubber band against the skin. You may be given a topical anesthetic cream to numb the area to be treated. Any discomfort can be eased with the application of cool compresses. After treatment, you can immediately return to normal activities. How soon will I see results? Are there any side effects? Because laser vein treatment works by causing the unwanted vein to break up and dissolve, resolution of the unwanted vein will take place over the course of several weeks. The most common side effect is bruising, or purpura, around the treated area. This will resolve within days of the treatment, and occurs only with some lasers used. Your doctor can discuss any other risks of laser surgery with you personally. Facial veins are fine blood vessels (otherwise known as telangiectasia) located on the face, usually around the nose and central cheeks. They can be the result of cumulative sun exposure, genetics, or rosacea. Many patients also refer to these as “broken” blood vessels or capillaries. Costs for each treatment session can range from $150 to $500. In some cases yes. Laser vein treatments, like other cosmetic procedures, are not usually covered by your insurance company. If you have any questions, it is best to talk with your provider. How many treatments are necessary? Is treatment permanent? Depending on the severity of the condition, multiple treatments may be required. Improvement generally lasts for several years, but over time new facial veins will develop, requiring a touch-up treatment at a later date. What treatments are considered medically necessary vs. cosmetic? Treatment of facial veins is considered cosmetic; consequently, the cost is not covered by medical insurance. If you’re considering a treatment and are interested in learning more, please schedule a free consultation by calling RefineMD at 920-380-9990.